Not only is Bruce one the jazz scene's most dramatic and stimulating performers, he is also a tremendously affable companion. A band-room with the Glaswegian Mr. Adams present is a happy and riotous place. His stream of jokes, anecdotes, and hilarious observations reflect an early immersion in show-biz, and a keen eye and ear for the many quirks of human nature. His stories are populated by a sort of Scottish-Runyonesque cast of characters, some of them long-gone pals of his father and uncle, who were both professional musicians. However, on stage, Bruce Adams takes the playing side of things very seriously. And he cut his musical teeth on solid commercial work - on cruise liners, in dance halls, music halls, and even worked in support of comedy legends like, Tony Hancock and Freddie Starr. 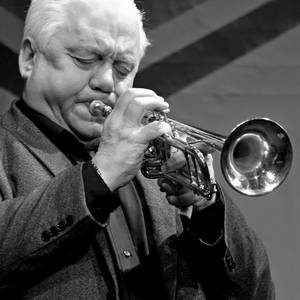 He has been a regular jazz poll-winner and with his spectacular range and power on the instrument has been in demand as a lead, and jazz trumpet man. Bruce has often worked as a special guest soloist with both the Scottish Radio Orchestra and the BBC Big Band. Bruce's long-running musical partnership with saxophonist Alan Barnes has produced many plaudits and acclaimed recordings.